Demographics Pro claims to help businesses grow their social media audience by using demographics that analyze, influence and target consumers. Numerous high profile businesses, including McDonalds, National Geographic, and Walmart, use this tool for consumer demographics. Consumer aspects include: ethnicity, location, occupation, interest brands, hashtags, influencers and stats. The company is able to analyze people tweets about the company and its products, or even how the consumer responds to campaigns. 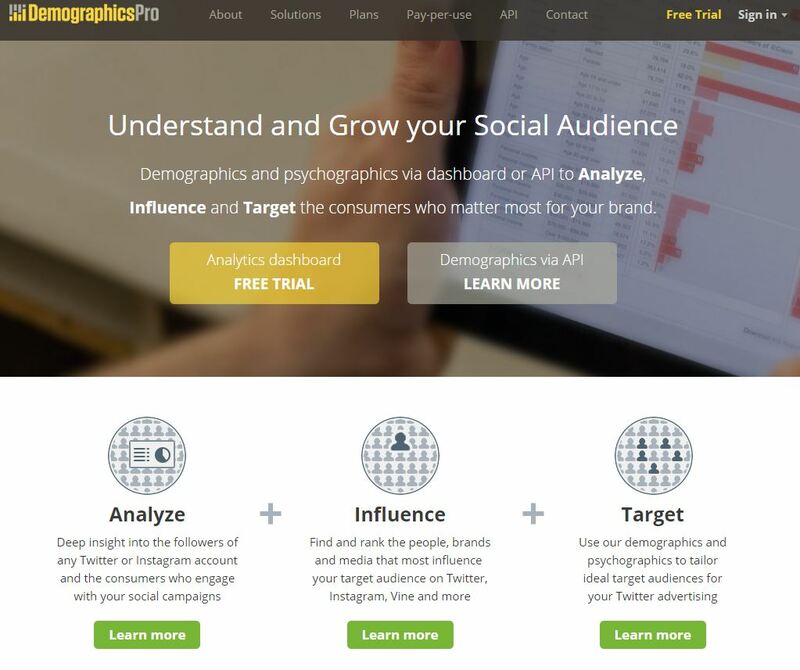 Demographics Pro works with Instagram, Twitter, YouTube, and Vine. However, in my opinion, none of these platforms carry the advertising weight needed to make a business succeed at a high level. A good example is Twitter. USA Today reported in February that Twitter has slowly been on the decline, dropping from 325 million users to 320 million users in the third quarter. What makes this scenario even more interesting is that Facebook’s advertising reaches 65.1 percent of the global social network ad spending in 2016 while Twitter only captures 9 percent of it. To access this program for a trial basis, request a pro evaluation account. This process includes filling out a form with your email and your social media account, along with primary interest and sample analysis. After submitting the form, the company states that it takes one business day for an account manager to send an email for an evaluation account. For me, it took more than one try and 3-4 days. Once you obtain approval, a you receive a 30-page report on the account you selected. I chose Twitter. This is a screenshot for an emailed report. 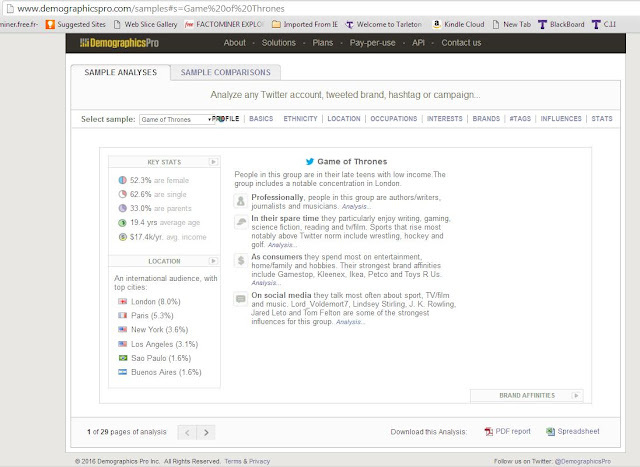 This shows a breakdown of Twitter analytics with the popular show Game of Thrones. I choose to use this instead of my own account information, because of the huge amount of followers, thus making it easier to see the graphs with more information. The report breaks down follower analytics into graph form. Categories include basics like marital status, income levels, and country location of household. Deeper research shows followers broken down by spoken language, occupations, and their likes and interests. The most fascinating thing is the breakdown of follower likes and dislikes. Every brand followed and hash tag used are broken down to the smallest percentage in easy-to-look-at graphs. Also shown is what influences your followers. Finally, this in-depth report includes how much time your followers spend on the platform (in this case, Twitter) accounts they follow, and their activity and settings on the site. This program is impressive for people who use Twitter to promote their brand or business. However, like previously stated, Twitter is no longer the rising star it once was. Depending on your consumer demographics, other social media sites might be a better fit than Twitter. I believe that this tool has staying power as long as Instagram and Twitter continue to have a standing in social media, and as long as the demographic you are aiming for is 30 or younger. I’m the editor of an online-only newspaper out of Parker County, Texas, and our main social media presence is Facebook because of our demographic. If we choose to reach out to a younger demographic, this program would be useful to us. Misty Browning is a communication graduate student at Tarleton State University. You can reach her at mistyb@txdailypost.com.